Provide comfort for the family of Robert Martinez with a meaningful gesture of sympathy. Robert “Mikey” Martinez, 53, of Eaton, passed away peacefully on January 16, 2019 in Eaton. 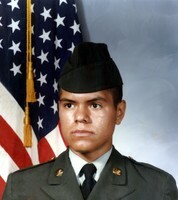 Mikey was born in Greeley to Mary Martinez (Gonzales) on December 19, 1965. He excelled in the Eaton school district and later joined the Army. Mikey was blessed with two daughters who were the center of his world. He loved playing softball with his work buddies and joking around with anyone he met. He was always there to offer a lending hand whenever anyone needed it. He will be greatly missed by all of the people he touched with his charismatic nature. Mikey is survived by his children, Erika & Samantha Martinez; brother, Ray Martinez; nephews, Julian, Carlos, and Benny Martinez; lifelong friend, Roberta Sanchez; and a large loving extended family. He was preceded in death by his mother; and siblings, Patricia, Richard, Louis, and David Martinez. To send flowers in memory of Robert Michael Martinez, please visit our Heartfelt Sympathies Store. Provide comfort for the family of Robert Michael Martinez by sending flowers. Just wanted to say sorry for your loss. I wanted to share a comforting thought from the Bible, at John 5:28:29 about a wonderful promise for the future. It says "do not be amazed at this, for the hour is coming in which all those in the memorial tombs will hear his voice and come out,those who did good things to a resurrection of life.